Manhattan is the center for world class cuisine. But you've never seen exotic food like this! I've researched the whole island to put together these foodie walking tours of out of the way and authentic food stops. Come explore these lesser known restaurants, bakeries and markets that cater to locals and visitors alike. 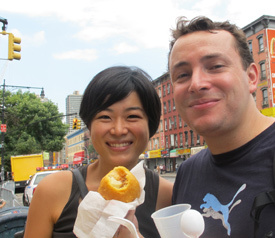 Here are some of the tours you can enjoy with Noshwalks in Manhattan. Also, don't forget about our other tours in The Bronx, Brooklyn, Queens, Staten Island, and parts of New Jersey. Visit our Walking Tour Schedule to see which tours interest you the most! 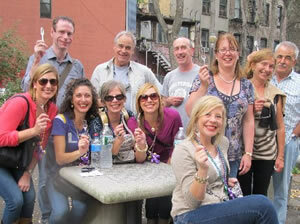 Sign up for one of our public food walking tours of Manhattan, or call to schedule a custom tour for your group outing. Cuchifritos, Mexican treats, French pastries, NYC’s best pizza and the historic Dance of the Giglio—an East Harlem tradition dating back almost a century. The tour begins at the Malcolm Shabazz Market, where West African vendors who have made their home in the area sell textiles, crafts, jewelry and other items.. This is the most popular of the three Harlem Noshwalks. On this tour we will explore Harlem’s fast-changing western fringe along Frederick Douglass Boulevard and Adam Clayton Powell Boulevards, where there are tastes of Ghana, Ethiopia, Ivory Coast, Jamaica—and more – and interesting changes under way as Harlem continues to develop. This route focuses on the diverse food, rich history and culture of Harlem's Mount Morris Park Historic District. Stops include bakeries, markets that feature Caribbean & West African specialties, and a Caribbean juice bar. This tour provides the best opportunity to see Harlem’s dramatic evolution in the past two decades. This tour focuses on the historic hub of Harlem’s 1920s/1930s Renaissance around 135th Street, where a new Renaissance is under way. We combine visits to bakeries, markets and other eateries with highlights of this area’s many landmarks, including famous churches. We have lunch at a West African buffet, with some of the best ginger beer in NYC. Forks Up in the East Village! This tour, introduced in 2012, takes you through a range of historic and hip places in the Village, and challenges your palate with tastes of India, Italy, Poland and Ukraine - punctuated with old fashioned egg creams and new-fangled hemp-based ice cream! The tour also highlights architectural and historic sites that abound in the East Village - and also points out many small markets and eateries (we can't go everywhere!) that you can visit on another tour. Your map includes listings of these destinations. 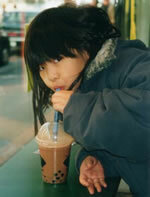 You can sample chocolate tapioca milk, just like this adorable little girl is doing, in Chinese and Korean bakeries and cafes in Flushing. This tour combines local history with visits to candy stores, bakeries, appetizing shops, Chinese markets and Little Italy’s best store. We also pass through several historic sites, including the Eldridge Street Synagogue Museum. As a custom tour during the week, it also includes the Essex Street Market, which is closed on Sunday, the day when it is scheduled as a Noshwalk. Future versions of this tour will offer information on new museums focusing on New York City’s Chinese and Italian immigrants, both within walking distance of the last stop on our tour. This eclectic tour highlights history and food venues between 97th and 116th Streets, mainly along Amsterdam Avenue. Be prepared for tastes of Ethiopia, Haiti, Dominican Republic, Cuba, India, & Hungary! The tour also highlights landmarks of the Columbia University campus (where we meet) and the famous Cathedral of St. John the Divine, where you’ll see some surprising sculptural work. In addition to noshing, this tour includes Audubon Terrace, an unusual museum complex; the uptown Trinity Church Cemetery, where naturalist John Jay Audubon is buried; theMalcolm X Memorial; and NYC’s oldest residence, dating from Revolutionary War days. The tasting on this tour is primarily Caribbean and Central American – and definitely delicious! It concludes at one of the best Dominican restaurants in NYC. This tour of upper Washington Heights is scheduled to coincide with the annual Medeival Festival in Fort Tryon Park near the Cloisters, New York City’s own collection of European medieval art and church cloisters (a branch of the Metropolitan Museum of Art). The food is a four course feast of Dominican, Salvadoran, kosher Russian, and more, and includes . We’ll conclude at Fort Tryon Park, where you can enjoy the festival (which is free). On occasion, this tour also includes a visit inside one of New York City’s landmarked movie theaters dating from the late 1920s- and this one has the original architecture and design and is simply extraordinary to see! Within New York’s Upper East Side, you can still find pockets of its famous East European heritage. We’ll visit bakeries, markets and cafes, plus landmark sights that remain in the neighborhood. In particular, this tour highlights German and Hungarian markets and related institutions that continue to operate amidst massive change.